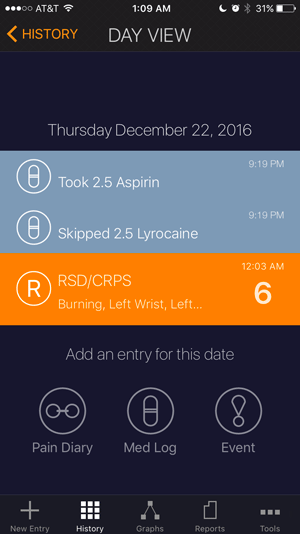 My Pain Diary is an award winning app which makes it easy to track your pain & symptoms and report to your doctors. Completely customizable to suit your specific tracking needs. Track as often as you want. Record as much data as you need. 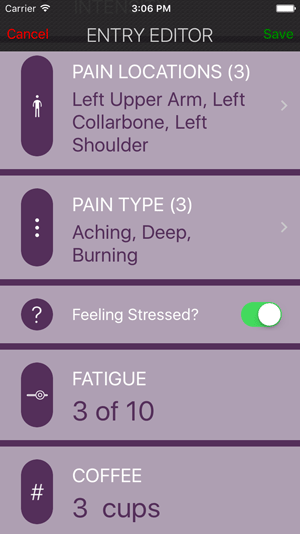 No other pain tracking app is as versatile or as easy to use as My Pain Diary. 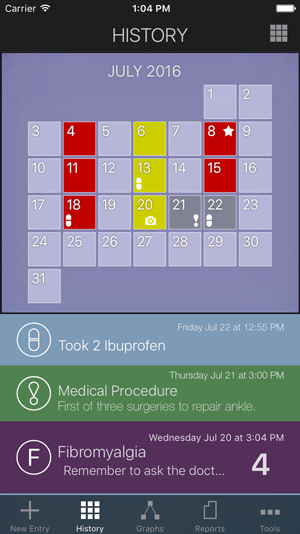 Here's a quick look at tracking pain and symptoms with My Pain Diary: GOLD EDITION for iOS. Managing chronic pain is hard. Why spend effort trying to remember important information until your next doctor appointment? 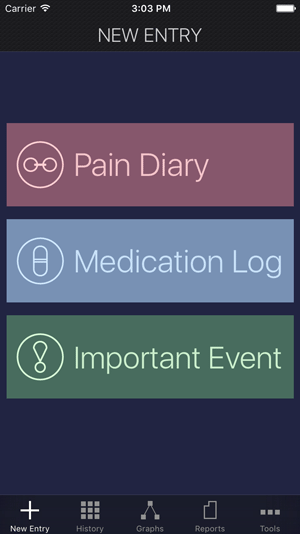 My Pain Diary saves all of your entries to a fully searchable History. The color-coded calendar gives you a sense of how you've been doing at a glance. 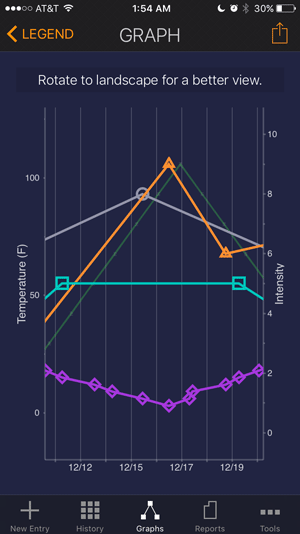 The Graph can help you identify trends and correlations while comparing up to 3 'plottables' and one weather metric at the same time. Does weather affect your pain and symptoms? Are you sure? 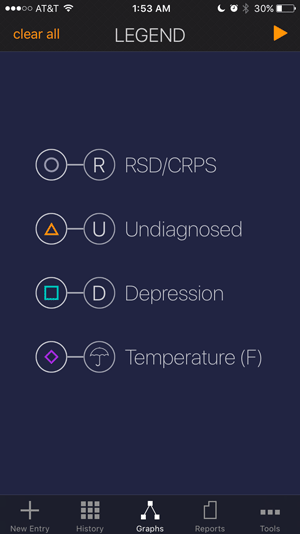 Overlay multiple conditions in an interactive graph to compare them and gain important insights which can be used to better manage your pain. 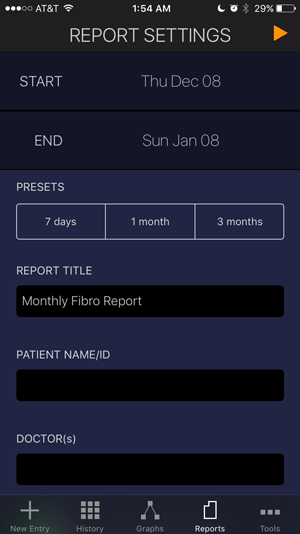 Generate a PDF Report to share with your doctors. Doctors love receiving these reports. Users have reported their doctors taking them more seriously after bringing a report to their appointments. 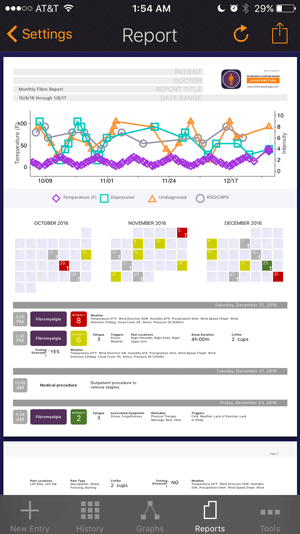 The report optionally contains Intensity Graph, color-coded-calendars, paind scale descriptions, photos, weather and more! Created by a chronic pain patient, for chronic pain patients.